San Francisco Mayor Joe Alioto’s traditional greeting was, “Hello, my friend.” His sunny Pacific Heights home has that same open-hearted feeling. The house, famous for its joyous parties and political celebrations, has the scale for formal occasions as well as versatile, casual spaces for the easy gatherings of family and friends. The striking view contemporary is set in a private, gated cobblestone courtyard on an unusually large parcel. Its central architectural theme is one of abundant natural light with views of the world renowned San Francisco Bay, the Golden Gate Bridge and Alcatraz Island. 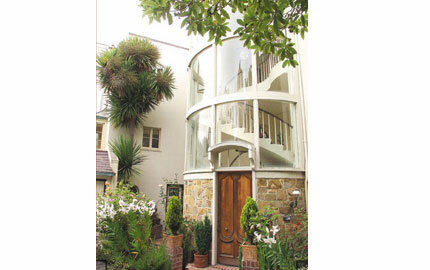 The exquisitely designed curved staircase is set in a tall, expansive glass surround, a veritable architectural sculpture unifying three levels of the house. The galleries, picture windows, tall doorways and ceiling height draw an abundance of natural light from the north and south exposures throughout the day. The interior by designer Ann Getty reflects the vibrant style of Mayor Alioto’s Italian heritage where each room provides the opportunity for memorable exchanges. The light, clean contemporary lines and sweeping views combine with the ebonized mahogany floors, whimsical rugs and comfortable furnishings to create an atmosphere for the lively conversations of civilized living from cozy family intimacy to the elegance of black tie. Enter the gated and very private landscaped COURTYARD with cobblestone MOTOR COURT which can accommodate six or more cars. A grand arched door opens into the flagstone FOYER with a view of the sun-filled back garden and terraces. The graceful staircase reveals its three-story sweep. 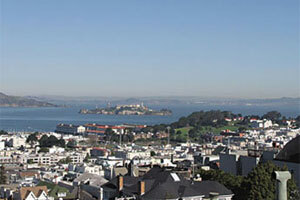 The open GALLERY boasts views of both Pacific Avenue’s Victorian painted ladies and the San Francisco Bay. The spacious LIVING ROOM features a view of the bay through tall French doors and a vignette window over the fireplace and floor to ceiling French doors which lead out to the expansive balcony overlooking the landscaped PATIO/GARDEN. The west wing contains the formal DINING ROOM with bay view. The butler’s pantry, complete with dumb waiter, leads to the sunny KITCHEN with breakfast nook. In the east wing the cozy view LIBRARY with fireplace, wet bar and adjacent BEDROOM and BATH offer the opportunity for an impromptu private GUEST SUITE. 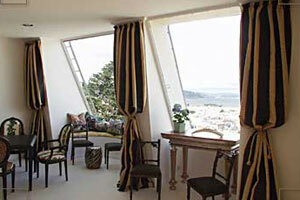 The second GALLERY provides even more enchanting views. 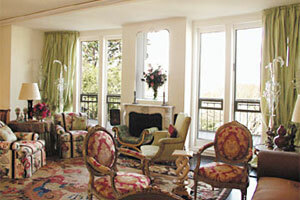 The grand MASTER BEDROOM with fireplace features romantic vistas the San Francisco Bay. The view MASTER BATH has a tub for two, plus immense closets and a dressing room. The spacious east BEDROOM with en suite BATH, dressing area, sitting area and fireplace has its own sweeping views of the bay. The cozy southwest BEDROOM overlooks the courtyard and has an adjoining BATH and dressing area. The delightful top floor FAMILY ROOM, with wet bar, enjoys commanding bay views from the Golden Gate Bridge to Alcatraz Island through the large mansard picture windows. Step up to the STUDY ALCOVE with adjoining full BATH. A thoroughly Mediterranean spirit lies at the informal heart of the house in its expansive POOL/SPA & ENTERTAINMENT SUITE which is accessed from the front entry by a double staircase. The versatile, informal LIVING ROOM has a media center and a fully equipped bar with garden view. 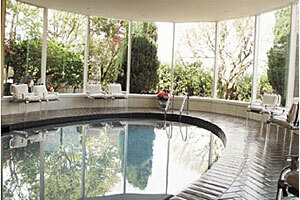 The oval indoor heated POOL is framed by picture windows looking out to the patio and garden. The pool area can be fitted out for parties with surrounding banquet tables or covered over for a dance floor! A full kitchen with barbeque and heating ovens is convenient for food preparation. French doors open to the sunny, landscaped PATIO & GARDEN terraced with flagstone pavers and brick flower boxes. Lovely fruit trees, rose bushes and seasonal blooms provide a park-like setting for alfresco dining and sunning. A SECRET GARDEN is nestled beyond the lower patio with a garden center/playhouse which enjoys full day sunlight. After swimming or sunning, enjoy the spa amenities of the SAUNA, shower, dressing room with half bath. The west wing houses the LAUNDRY ROOM, extra storage and the THREE CAR SIDE BY SIDE GARAGE with two service entrances. When entertaining, the best parking to be found in the neighborhood is the MOTOR COURTYARD which can accommodate six or more cars.